The main problem with looking at the financial world from a “dollar” funding perspective is that there really is no such monolithic existence. The funding conditions in Russia may be very different than those of Swiss banks; they also may be far too similar. Given the impossibility of direct observation, being left outside and searching for interior clues that bubble out every now and again, that means a broad range of indications are necessary to even think about suggesting hardened opinion. 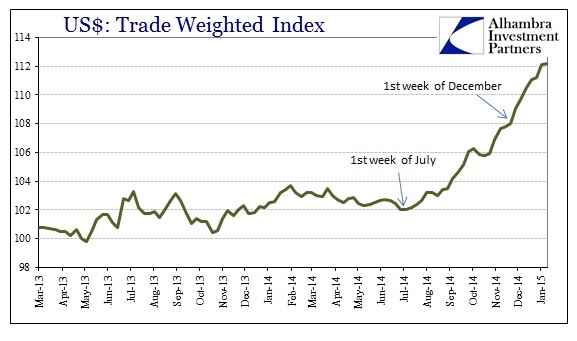 As a start, the trade-weighted dollar index is helpful in framing the general terms. But I think it’s over-appreciation for the euro in light of that proportion sometimes leaves it susceptible to only that comparison (or the yen). Thus, it may disregard far too much of other “dollar” function where it is less generalized. Even still, there does seem to be a bit of a break in “dollar”-driven global discomfort these past two weeks. Whereas December was sharp and dangerous, January in the broader, global sense may be calmer outside of Europe. That may suggest the target of retrenchment has shifted from Russia or Brazil to Switzerland or even Europe in general. 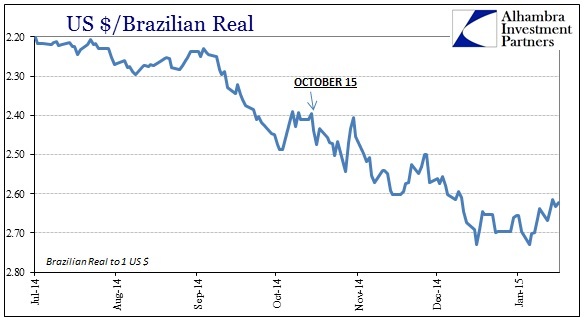 As far as the emerging “dollar” proxy, that seems to be the case, as the Brazilian real, for example, has taken a break from disorder these past two weeks as Europe demanded the glaring focus. 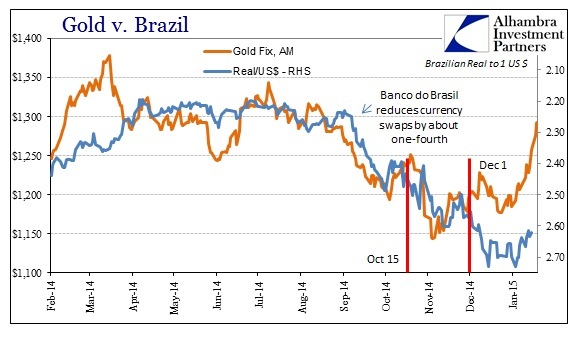 That makes renewed interest in gold that much more difficult to separate. Clearly there is a sustained gold bid these past few weeks, but that it has coincided with what looks to be a break in “risky” dollar behavior clouds the interpretation. 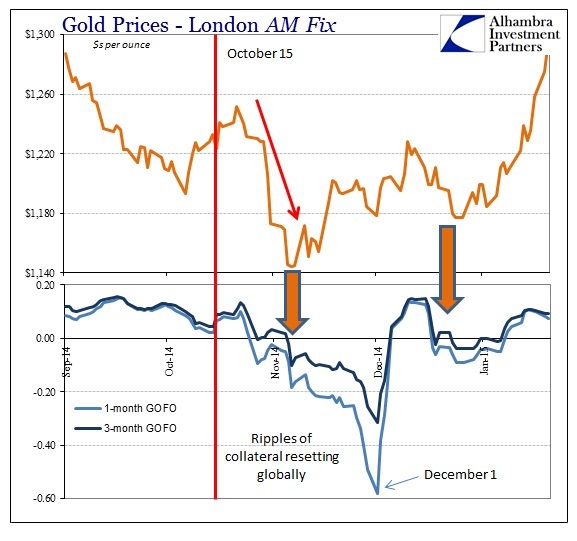 I have little doubt that there is a renewed bid for safety underneath the gold price, but I would be more convinced of its robustness if it were evident at the same time as negative price pressures from gold-as-collateral substitution. This latest upswing dates back to just after October 15, which is a pretty powerful statement itself about both the function of the global “dollar” short as well as how that affected, potentially, perceptions about the need for the ultimate hedge. That the price of gold diverged on December 1 from the real, a “dollar” proxy, strengthens that interpretation still further.  We will have to see if it survives another dramatic inclusion of wider, non-European “dollar” disruption, or if it yet again succumbs to this never-ending tie-up with international wholesale desperation. The Fed has tested now two distinct programs by which it claimed, each on separate occasions, to be definitive toward the desire to gain “control” over the short-term interbank rate situation. 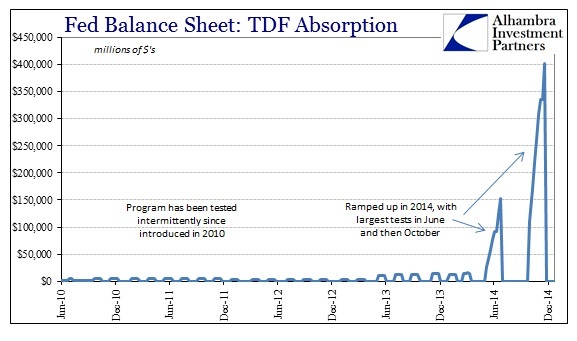 In the space of these past six or seven months (dating back to the outbreak of repo fails in June), both programs have been shown to be almost totally indiscreet, and thus wholly ineffective. I think that may, again, indirectly, be providing some measure of uncertainty bidding under the price of gold during this period. Not only is there significant “dollar” disruption of its own accord, the FOMC has made plain yet once more that it doesn’t know what it is doing. A policy apparatus that is essentially out of control and completely powerless, if not totally oblivious, to highly vital “dollar” function is certainly a case where financial participants might increasingly desire a “worst case” hedge. Like the eurodollar curve, then, the price of gold may be telling us that increasingly financial agents are at least increasingly unsure about the future whether or not the Fed actually gets to “tighten”; it may not matter either way and end up in the same disastrous condition regardless. 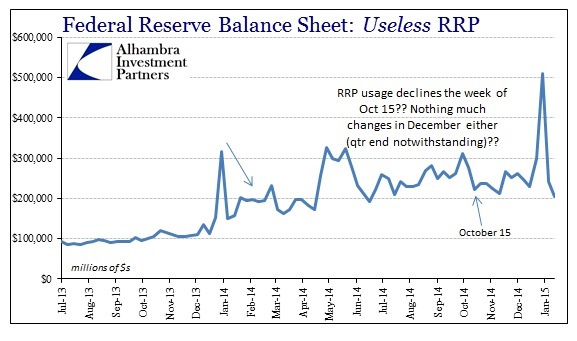 As I said, the quantity of bank reserves have largely plateaued with the end of QE (the TDF’s effects notwithstanding temporary presentation otherwise) which would seem to provide no backdrop for gold’s bid under convention. Recent strength persists anyway. With gold forward rates looking like there is perhaps about to be another “dollar” disruption, it will be interesting to see how gold behaves given this run from the October 15 appearance of open and broad financial difficulties. The behavior of the operational end of the Fed’s exit, I believe, has only served to heighten potential worries about the whole range of problems that already exist (lack of any economic progress chief among them) and so gold has largely joined dollar credit markets in growing unease and even rising fear. It isn’t really about interest rates or “inflation”, obviously as gold is rising as inflation “expectations” dramatically sink here, so much as gold is insurance against central banks being wrong. That seems to be the common theme all over the world ever since June when the ECB placed its desperation and impotence on full display. 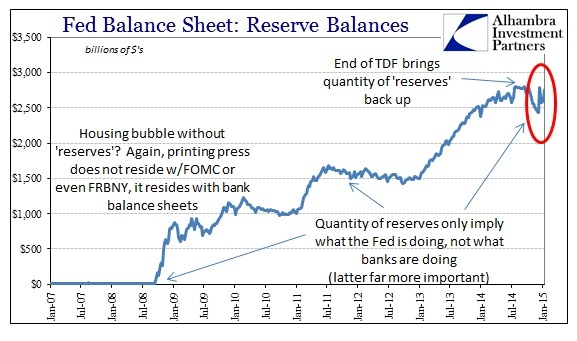 Everything that has occurred since then has only confirmed the monetary illusion being exactly that, including the US and its central bank’s place at really the central point of the miscalculated insanity.